Oil palm plantations and smallholdings are expanding massively in Indonesia. Proponents highlight the potential for job creation and poverty alleviation, but scholars are more cautious, noting that social impacts of oil palm are not well understood. 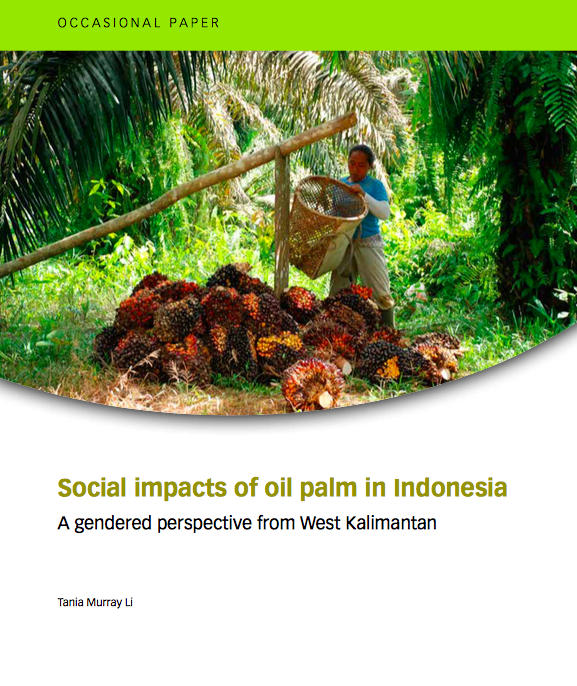 This report draws upon primary research in West Kalimantan to explore the gendered dynamics of oil palm among smallholders and plantation workers. It concludes that the social and economic benefits of oil palm are real, but restricted to particular social groups. Among smallholders in the research area, couples who were able to sustain diverse farming systems and add oil palm to their repertoire benefited more than transmigrants, who had to survive on limited incomes from a 2-ha plot. Over time, plantations that monopolized large areas of land constrained smallholder options and limited opportunities to prosper from oil palm or other crops, such as rubber. Among plantation workers, who were initially recruited as couples, privileged positions in the plantation core deteriorated; plantations began to employ more casual workers and recruit men and women from distinct labor pools. Situating this particular, site-specific trajectory in the context of broad historical trends and spatial dynamics indicates that further expansion of plantation-based oil palm poses a serious risk of impoverishment, especially for women. Conversely, support for independent oil palm smallholding offers good prospects for empowering both women and men, and enhancing their prosperity. Investment in oil palm processing would be especially beneficial for young women.